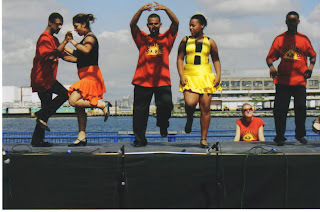 The 9th Annual Brooklyn Community Board 7 Waterfront Festival takes placer today on the 58th Street Pier, off First Avenue, in Sunset Park. It runs from Noon-6PM and includes food, music, art, peformnces, boat rides and more. Here are some of the listed activities: Music / Art / Dance, Refreshments / Food, Canoe trips / Free boat rides, Community information, Health / Dental screenings, FDNY smokehouse, Historic buses...and more. You can find more information here at their website. Just in case you're wondering how many different choices of activities you have in Brooklyn this weekend, check out the long list posted yesterday by Brownstoner.